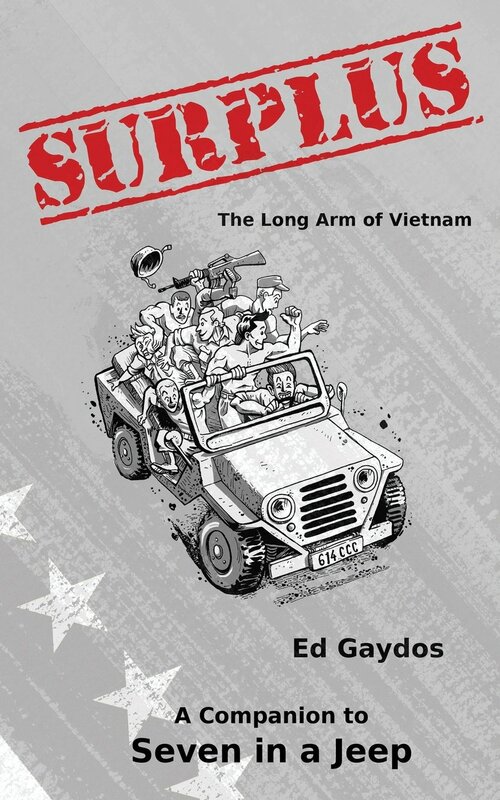 Surplus: The Long Arm of Vietnam, by Ed Gaydos, is now available for purchase in e-book form from Amazon. You can pick up your copy here (paperback), or get the Kindle version here. A companion to Seven in a Jeep, Surplus continues Ed’s story after he returned from the Vietnam War in 1971. This illuminates the lessons that shaped his life as a person, a father and a successful executive. Surplus is available as a paperback or a Kindle book. If you’ve already entered our current contest, you’re in the running for a signed copy of Surplus, along with a $20 Amazon gift card. As always, you can pick up a copy of Seven in a Jeep on Amazon. It’s good to make friends. In addition to the wonderful people we’ve been meeting in person at book signings and speaking engagements, there are a wealth of great authors out there on the Internet. Small presses and independent publishing are growing by leaps and bounds. One of our new friends out there is writer Shannon McRoberts, author of Verses of Athine: The Daughter of Ares Chronicles. You can find out about her work on her blog, The Obsidian Poet. Shannon was kind enough to tell us a little bit about herself, and to let Ed do the same on her blog. So without further ado, what’s new in the world, Shannon? 1) Tell us a little bit about your book, Verses of Athine: The Daughter of Ares Chronicles? What are the main highlights? The book is the overhauled version of all four of the stories in my series that have been published so far. It focuses on Athine, an immortal born goddess, and her rise to obtain her mysterious destiny. Is it her true destiny or one of someone else’s design? 2) Tell us a little about yourself. What is an interesting fact that you would like to share with the readers today? 3) What is your favorite part about writing? The creation of a plan and throwing in the twists and turns. 4) What are you working on right now? Is it top secret? No, I am still pounding away at Cursed Bloods, which is the next book in the series and picks up where Verses of Athine stops. Both. Although I am more likely to eat ham because I have to be in the mood for Bologna. 6) Do you listen to music when you write? Yes, I have to. I have ADHD and I find that if I’m distractible I need the music to occupy my brain so I can concentrate. I am mostly into heavy rock type music, but I also like country and sappy love songs (the sad depressing kind). 7) Where can we find books you have written? You can find me on Amazon and Smashwords along with B&N, Kobo, Sony, iBook 😉 I also have a few nice sites to visit: www.shannonmcroberts.com, www.daughterofares.com, and www.theobsidianpoet.com. I am constantly working on finding new website layouts. I have recently discovered WordPress self-hosted and I am loving it! 8) What genre do you like to read? Fantasy mostly and sci-fi. Paranormal things. Sometimes I will read a romance IF it is something like Lara. 9) Anyone you would like to give a shout out to? Right now I would just like to give a shout out to my peeps at ASMSG (asmsg.weebly.com) and say go and visit this great group. 10) How long have you been a writer? I have been writing since I was old enough to write I didn’t come back to prose writing until around 2005 when I wrote The Secret of Genetic Corp X. 11) Do you write any poetry or make any kind of art outside of writing? Why yes I do! If you visit my www.shannonmcroberts.com or www.theobsidianpoet.com you can find a link to my Renderosity Gallery and Poetry blog! 12) What advice would you give to new authors? If you have to spend your pennies wisely, invest in an editor. Find good cover art even if you have to buy something pre-made. Write the story YOU want to read. Don’t copy someone. Don’t listen to people who are mean just to hear the sound of their keys clacking. Don’t give up on yourself. 13) What is the most important thing you have learned about marketing your “brand”? If you are not on the internet you do not exist to many of today’s world. You need to be on Facebook, GoodReads, Twitter, and have a website. The more you are out there, the more your SEO goes up and the more likely people will find you! It’s time for our latest book giveaway for Seven in a Jeep, this time with a little something not available for purchase. We’re giving away a handful of autographed, limited edition Advance Review Copies (copies that are given to reviewers ahead of time, and may still contain some proofing errors). The giveaway is taking place through Seven in a Jeep‘s Goodreads page, which you can access here. The giveaway ends in less than three days, so if you want a chance to get on it, check it out right away. If you can’t wait for the giveaway, you can always find Seven in a Jeep in both hardcopy and digital edition on Amazon. Speaking of giveaways, have you taken a photo yet for our $20 Amazon gift card contest? You can find all the details about the contest here, but the short version is this: snap of photo of yourself (or a friend) reading Seven in a Jeep in a creative or interesting location. Post it to social media with the #seveninajeep hash tag, and you’ll be entered for a chance to win a $20 Amazon gift card, along with a signed copy of Surplus: The Long Arm of Vietnam. Pretty easy, right? We thought so. We had a great time yesterday swapping stories and watching Ed give his presentation on Seven in a Jeep to the Upper Arlington Senior Center current events discussion group. Our thanks go out to Earl Goldhammer for helping to organize the event. One thing that always impresses me is the level of service performed by the generation represented at the UA senior center. Going around the room, nearly every senior in attendance either served in the Armed Forces, or supported a spouse or child who had served. Throughout Ed’s informal presentation, the other veterans shared their stories (both humorous and sobering) from their experiences in World War II, Korea, and even Vietnam. It’s one thing to read these sort of stories in a book; it’s a completely different experience to hear the tale as the one who experienced it speaks. This is why we do what we do. Speaking of stories, we recorded Ed Gaydos telling a few of his own – here’s a little clip of him telling the tale that gave Seven in a Jeep its name. As always, you can pick up your copy of Seven in a Jeep on Amazon. July looks like it’s going to be a busy month for the folks here at Seven in a Jeep. Between new contests, special holiday sales and public speaking engagements, Ed’s going to have his hands full for the next several weeks. And that’s the way we like it. Photo by Steve Dunleavy, courtesy of Flickr. Our Independence Day Sale is underway, and will continue for the rest of the week. To honor the holiday, the Amazon Kindle edition of Seven in a Jeep is available for only 99 cents. The latest book contest is well underway. For a chance at a $20 Amazon gift card and a signed copy of Surplus, all you need to do is photograph yourself reading Seven in a Jeep in an interesting setting. You can check out the details here. Ed will be speaking at several spots around central Ohio this month. Kicking things off next week will be a presentation at the Upper Arlington Senior Center with its Current Events Discussion Group on July 9, followed by a book signing at The Book Loft in Columbus on July 11. Feel free to come out and join the discussion! In honor of America’s birthday, we’re offering Seven in a Jeep for Amazon Kindle for only 99 cents! Find the Amazon Kindle book here. What better way to celebrate our nation’s independence than by reading the real stories of the real soldiers who served their country and risked their lives? “We fought, and some of us died, out of devotion to fellow soldiers, not for some larger sustaining cause.” – Ed Gaydos, Seven in a Jeep. This is patriotism. Not a Kindle user? Seven in a Jeep is carried on all major markets, find them all here. The price will never be this low again. To those who serve their country and the greater good, we salute you.